Electrostatic labels without any glue. A special material called electrostatic is used for removable labels to be applied on screens or on smooth surfaces without adhesive. 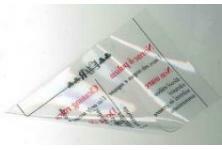 This PVC is transparent and without adhesive. The application on the smooth surface occurs through the electrostatic charge given to the adhesive during the manufacturing. We use a back microaspirant material for hard surfaces. It is a soft polypropylene called microaspirant that is neither adhesive nor electrostatic.